The winning design and some information. Der Provisorische Landtag des Gouvernements Estland (estnisch Ajutine Maanõukogu, inoffiziell Maapäev genannt) war zwischen dem 14. Juli 1917 und dem 23. April 1919 das Parlament des Gouvernements Estland. Maapäev ist halt die wortwörtliche Übersetzung von Landtag. Ajutine Maanõukogu ist "provisorischer Landrat". Ein schönes Motiv und bei dieser fremden Sprache kann man soviel lernen. Quelle: Facebook 2 Euro swap club. At 13.00 on 26 June Eesti Pank will present the two-euro circulation coin with a special design dedicated to the events that preceded Estonian independence in the White Hall of Toompea castle at a meeting of the Noorte Maapäev Youth Assembly. The coins will enter circulation and be available from the online shop from 14.00 on 26 June. On 26 June 1917 a regulation on the election of a provincial council was published in the Tallinna Teataja newspaper, setting out the procedures, main dates and other details for the election of the Estonian Provincial Assembly, or the Maapäev. Exactly 100 years to the day later as part of the celebration of the centenary of the Republic of Estonia, school students who are standing for the Noorte Maapäeva Youth Assembly will all come together. 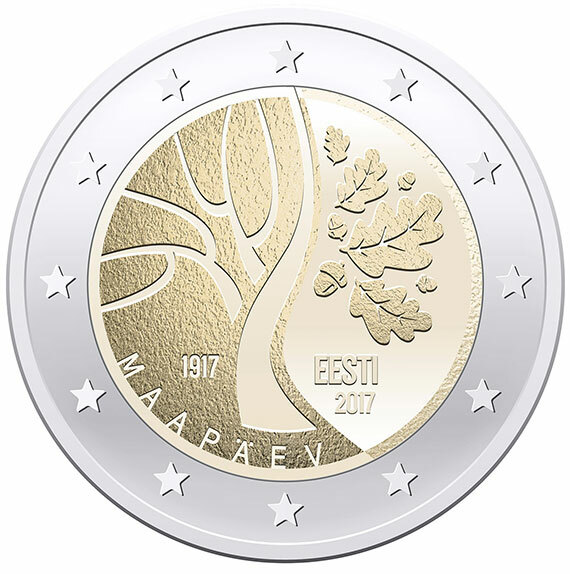 “Eesti Pank is greatly honoured to present the two-euro circulation coin at the meeting of the Noorte Maapäev. The original elections to the Maapäev provincial assembly and the decisions taken by the Maapäev laid the foundations for Estonia to become an independent republic on 24 February 1918. By presenting the coin on 26 June we are symbolically bringing together different generations from the past and from today, in the same way that the national side of the commemorative coin does”, said Ardo Hansson, Governor of Eesti Pank. A two-euro commemorative coin is a circulation coin with the usual common side and a special commemorative design on the national side. In all, 1.5 million of the coins will be minted. Of these, 10,000 will be packaged as souvenirs with a coin card and a price of seven euros. The coins were minted by the Lithuanian Mint and the coin cards were made by Kurowski Group Sp. z o.o. of Poland. Eesti Pank will start to release the coins to banks from 26 June. After that they will start to enter general circulation through retailers. The coins and coin cards will also be on sale in the Eesti Pank online shop from 14.00 on 26 June and from 27 June the commemorative coins and coin cards will be available from the Eesti Pank museum shop. The coin card will also be on sale from 27 June in the post offices of Eesti Post that sell collector coins and other collector items, but the post offices will not sell individual coins or rolls of coins. Each purchaser can buy up to ten coin cards. The coins and coin cards cannot be booked in advance. There is no limit on how many commemorative coins can be bought. Individual coins and rolls of coins will be sold at their face value, but there will be a service fee for larger orders that relates to the weight of the coins. Eesti Pank retains the right to change the amounts on sale in response to demand. Dann wäre es schön, wenn sie auch direkt nach Deutschland schicken würden, ohne dass man tricksen muß. :? Kreditkartenbezahlung war bei mir nicht möglich, Überweisung hat geklappt. Zuletzt geändert von hrs1 am 26. Juni 2017 15:05, insgesamt 1-mal geändert. Dann lasse ich es mir halt nach Schweden schicken. Ich bin eh nächste Woche da. In Tartu bei der Post leider nicht mehr zu bekommen.